A ketogenic diet has tons of health benefits but it can be more expensive than a traditional carb-heavy diet. That said, it is entirely possible to eat keto on a budget. This guide will show you how to eat keto without breaking the bank. Eating keto takes some planning and effort. Figuring out your macros is just part of that. When eating keto on a budget, there is some extra work involved. Premade food is convenient and easy, but it almost always comes with a higher price tag. Try to make as much as possible yourself. Tools like food processors and crock pots can be your best friend because they simplify food prep. You can make nut butter and salad dressings yourself pretty easily. This will ultimately cost less money and be better for you. Buy cheese in blocks and shred it yourself. Take time each week to do food prep for the rest of the week. You can pre-cook food and put it in the refrigerator in properly portioned servings to heat up later. It’s even a good idea to package up snacks for the week, like servings of nuts. It takes some effort but by putting in a solid afternoon of food prep on the weekend, you will be totally prepared for eating well all week. It’s a good idea to buy in bulk. You should try to buy as much in bulk as you can. Buying meat and vegetables and even butter this way and then freezing will save you a lot of money in the long run. Membership to a warehouse store like Costco or Sam’s Club comes with a price tag, but with the deals you can get on meat, in particular, this quickly pays for itself. Sometimes buying in bulk means quite a bit of extra prep time. For example, you can sometimes get great deals on specific cuts of chicken but other times, buying whole chickens is a better deal. This will mean some extra time and effort to butcher the chicken yourself. It might be worth it to buy a chest freezer since the average refrigerator freezer can only hold so much. Because buying in bulk and freezing can be such a smart financial move, spending the money on a chest freezer can be worth it. Like with food, price shop and look for deals. You may even be able to find a decent used one at a fraction of the cost of buying new. When freezing a lot of food, it’s very important to mark dates. Some meat will be safe to eat for up to a year, but other meats will need to be eaten or tossed sooner. Check the charts on Foodsafety.gov to see how long a specific food items can be kept in both the refrigerator and the freezer. Mark dates on everything and make sure to pay attention so that you eat the oldest food before the newer food. It also might pay to invest in a vacuum sealing machine. By removing air from freezer bags, you will cut down on the space they take up in the freezer. This will also extend the life of the food, keeping it fresher and tasting good for longer. Use Coupons! Look through the coupon inserts from the newspaper. Explore the many coupon websites out there today. Try coupon apps. Check to see if your local stores have any current coupon promotions. This definitely takes effort, but when you score a great deal, it’s worth it. Shop at discount stores. The quality of food at some discount stores isn’t great, but it is possible to find some good stuff at many of them. Aldi, for example, often has some pretty high-quality meat and produce. See what’s on sale each week. This might mean adjusting your meal plan for the week, but when your local grocery store or warehouse store has an incredible deal, you should jump on it. Sometimes, buying food that is close to its expiration date will be a great deal. Many stores sell meat that is close to expiring at a fraction of the cost. Freezing meat near its expiration date is a good way to extend its life. Buy specialty ingredients in bulk, especially when they are on sale. The cost is more upfront, but buying in bulk can save you a lot of money over time. Always price shop! The price at your local health food store is probably a lot higher than you can find elsewhere. Shop online. The best prices for specialty ingredients can usually be found online. The fattier cuts of meat are often cheaper, which is convenient since you want fatty cuts on the ketogenic diet anyway. Choose ground chuck and chicken thighs and pork belly over other cuts for a lower price and a solid keto choice. You can also stretch your dollar and add to your diet by making bone broth with bones and rendering excess fat for cooking. As mentioned previously, you might not be able to stick to your intended meal plan based on what is on sale. It’s important to stay flexible and adjust your meal plan based on the prices available on any given week. Another aspect to keto flexibility is choosing seasonal veggies. When vegetables are in season, they are generally cheaper. Asparagus and spinach, for example, are in season during Spring and will be cheaper then than other times of the year. Broccoli and bell peppers, on the other hand, are in season during Fall. Don’t Let Food Go to Waste! The average American lets an astounding amount of food go to waste each year, between 25 and 40 percent. This is the number one way to ruin your budget. Letting food go to waste is throwing away money. It’s important to buy food that you will eat and to pay attention to dates. Make sure that everything you’re not freezing will be eaten before it goes bad. Don’t buy more than you can eat. It might get boring after a while, but one of the best ways to stretch your dollar while eating keto is to stick to the same, simple foods. Rather than making elaborate recipes with all kinds of ingredients, stick to just basic meat, fat, and veggies. You can use spices to add some variety and keep things interesting. Different spice combos can make chicken taste completely different. Like with everything else, buying spices in bulk can save you money over time. Choose a few contrasting spices you like and use them to make the same thing seem different from day to day. You might think diet soda is okay because it doesn’t have any carbs. That doesn’t make it good for you, though, because it’s loaded with chemicals. It’s also not good for your budget. Cut diet soda and stick to water, coffee, and tea. Spend the money you would be spending on soda on quality food. When eating keto on a budget, it’s easy to be tempted to always buy the cheapest food available. While this is often a good choice, sometimes you should choose a higher quality product instead even if it is a little higher in price. One example of this is butter. Grass-fed butter is so much better for you and the keto diet typically includes a lot of butter. Don’t skimp when it comes to butter. Ideally, you should also try to buy grass fed beef. Grass-fed beef and dairy have a much better ratio of Omega-6 and Omega-3 fatty acids. Look for deals and try to buy grass-fed as often as you can. When you can’t buy grass-fed beef, you should stick to other protein sources like chicken and eggs and pork. 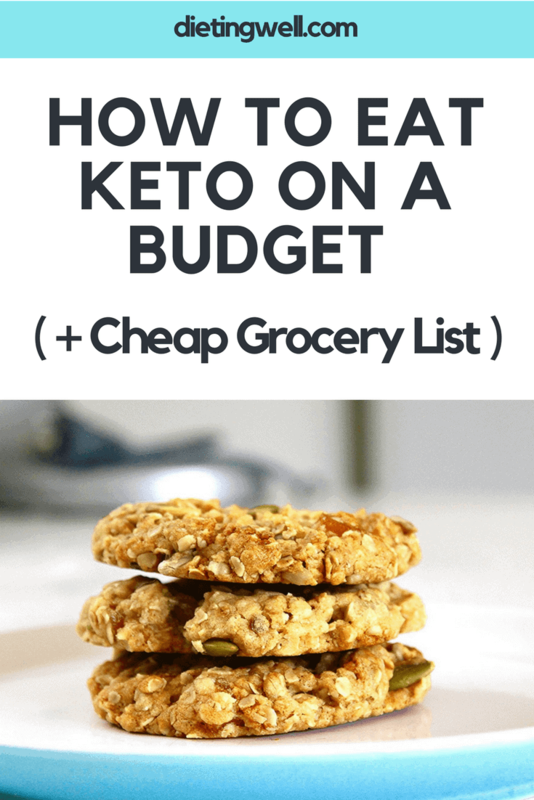 Finding other areas of your budget to cut back can give you the room to purchase some of the more expensive keto foods like grass-fed meat and dairy or specialty flours. Maybe you can cut back the amount of data you need with your wireless plan. Or, you can cut cable and stick to cheaper online streaming for your entertainment. Try buying used clothing instead of new. With a little attention, you can probably find a number of things to cut back on in order to expand the portion of your budget devoted to food. Get a free downloadable PDF that you can download, print off, and use on your next trip to the grocery store. You can probably get by with just a handful of basic foods. This short list will give you the most bang for your buck. Just sticking to these foods will help you stretch your dollar as far as possible, but you might get tired of eating the same things after a while. Eggs are extremely cheap and versatile, making them a vital part of the shopping list. You can substitute items from the extended list to mix things up, especially if there is a great sale or deal available. Some foods on this extended list may typically be a bit higher in price. When you use your skills as a deal detective, though, it’s possible to get them for a great price. Avocados, for example, are often fairly expensive, but sometimes you can find them for a very low price. As you can see, eating keto on a budget is easier than you might have thought. Stick to the basics, hunt for great deals, buy in bulk and freeze, and take the time to do food prep. 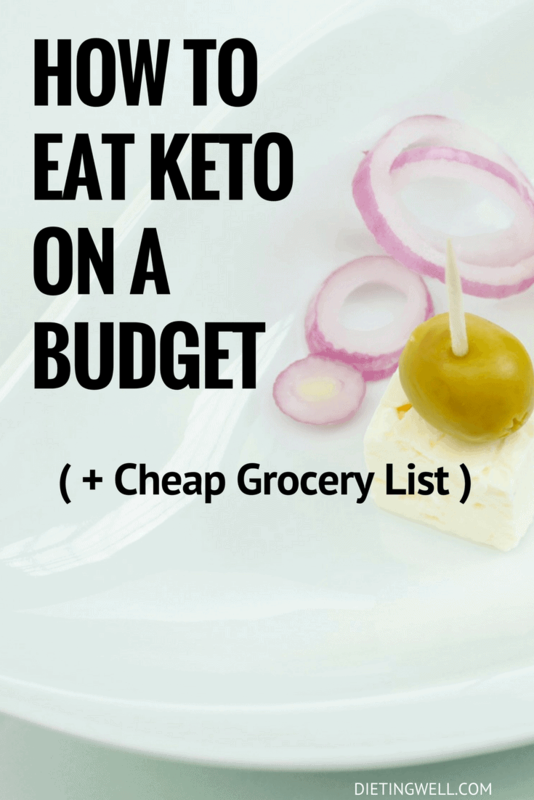 It does take some extra effort but you can eat a delicious and healthy keto diet without spending all your hard-earned cash. If you have any experience with eating keto on a budget or you have a question, let me know in a comment below. I have now lost 1 stone in just over 4 weeks weighing 12st 6. I want to maintain my weight but lower body fat. Do I keep to my macros’s but up my calorie intake to my BMR of around 1800 kals and continue to train cardio and weights? Also my carbs are 20g per day as we stand but will increase as I increase my kals. Do I need to keep it at 20g to avoid knocking me out of ketosis? Something I’ve never tried but am looking into is buying a half or quarter cow from a local farm that raises grass-fed beef cows and splitting it with friends. I live in Michigan; there are several farms that do this within an hour’s drive from me. Buying a quarter of a cow and splitting it with a friend means you’d end up with a large amount of ground beef, several steaks, some ribs, bones for stock, and liver if you ask for it, all grass-fed and direct from the farm for the same or less as at the grocery. I buy tons of meat and freeze it. I buy coconut flour from a bulk bin and it uaually comes out pretty cheap. My rule of thumb is if I cant use that ingredient in at least 3 dishes this week, don’t but it. When I first started Keto, I ran out and bought every expensive specialty item I could. Most of them are sitting up in a cupboard barely used, because with my macros set at 75/20/5, there’s not much room for coconut/almond flour-made goodies. I go to Trader Joe’s a lot because they do have some specialty items that are fairly decently priced. Also buying cheese in bulk is the best thing ever, way cheaper than buying pre-shredded bags. I also buy a lot of frozen broxxoli and cauliflower florets that I can whip out whenever I feel like it. Thanks for the tips!! Definitely gave me for food for thought (pun intended). I’m new at this and grabbing onto all the information I can get. I know what macros are and what they should be. Ashley talked about having them set at 75/20/5. How do you”set” them. Is it just mindfulness or is there something else to help you know they will end up that way at the end of the day? You can use specific apps like MyFitnessPal, which let you put in the percentages of your goals for fat, protein and carbs. You can calculate your calories per fat, protein and carbs and count them that way. I was disappointed when your justification for cutting diet soda was “it’s loaded with chemicals.” What, are you worried about overdosing on Dihydrogen Monoxide or something? Or were you referring to all those studies over the years that failed to show any harm in consuming aspartame? some people don’t want to consume chemicals. period. i try to only eat real food. there’s nothing weird about advocating for eating actual food over a chemical compound. On top of that, aspartame has been shown to create the same insulin response as sugar and is a hunger trigger just like sugar as well. Since when did they “prove” that aspartame isn’t harmful? Idk how old this thread is, but I’m just seeing it today. Most of these foods are not available in the country I’m living in. Most people eat bread, rice, and cooked dry beans. The only available protein sources are chicken and eggs (goat also but it’s very expensive). I can get coconut products (expensive) and butter (not grass fed). Do you have any other ideas for me? I’m pretty limited in choices. I also can’t eat dairy. You had me until “diet soda is full of chemicals” . Everything is a chemical, everything, by definition. Be specific and literate or your credibility tanks. Diet soda helped me through my first few months of keto and had no ill effects on me at all. Thank you for taking the time to write this out! This is a great, comprehensive, budget friendly list. I cut out all pop and do drink some flavored water, but mostly plain water. I am down 10 lbs. in the first few weeks. Gained a pound and then quickly dropped that. There is so much you can eat and I am grateful that this is a diet that I can stick to. I haven’t had any candy, pies, cakes or cookies, which is a miracle for me. I do chew a stick of sugarless gum when I really get a sweet tooth.